Joshua Heath Bagwell, age 36, passed away February 13, 2018. Mr. Bagwell was born in Pickens County the son of his late father Dale Edward Bagwell and survived by his mother Caroline B Tripp and step-father John Tripp of Easley. Survivors include his fiancé Amanda Brown of Pickens, one daughter; Skylyn Marie Brown of the home, one brother; Thaddus Dale Bagwell (Roxanne) of Liberty, two uncles; Brian Davenport (Jenny) of Seneca, Joey Bagwell (Tonda) of Liberty, niece Aubrey and nephew Dylan Bagwell, grandparents; Joe and Nancy Bagwell of Liberty, Patricia Ann Davenport of Texas. He was buried at Liberty Memorial Gardens, Liberty, Pickens County, South Carolina. Joey Bagwell is the son of Joe Edward Bagwell and Nancy Smith. Joey Bagwell married Tonda (?) after 1977. Lewis Hobson Bagwell Jr. was born on 15 June 1926 in South Carolina. He was the son of Lewis Hobson Bagwell and Eunice Elizabeth Painter. Lewis Hobson Bagwell Jr. died on 16 December 1998 in Christiansburg, Montgomery County, Virginia, at age 72. Nannie Pearl Bailey was born on 28 March 1880 in Cross Keys, Union County, South Carolina. As of before 1916,her married name was Bagwell. She married David Hampton Bagwell, son of John Owen Bagwell and Ona Bailey, before 1916. Nannie Pearl Bailey died on 14 January 1946 in Dorchester, South Carolina, at age 65. David Horace Bagwell was also known as Horace Bagwell. He was born on 6 April 1916 in South Carolina. He was the son of David Hampton Bagwell and Nannie Pearl Bailey. He served as a Sargent in Battery , 377 Parachute Field Artillery Battalion during World War II. First activated on 16 August 1942 at Camp Claiborne, Louisiana, as the 377th Parachute Field Artillery Battalion (377th PFAB). The 377th PFAB, under the command of Lieutenant Colonel Benjamin Weisberg, participated in the development of doctrine for the employment of Parachute Artillery. After training in the United States, the battalion sailed to England, arriving in Liverpool on 18 October 1943. During late 1943 and early 1944, the battalion participated in training in preparation for Operation Overlord (Normandy). On 6 June 1944, the 377th PFAB participated in Operation Overlord, the Normandy Invasion, parachuting onto Drop Zone A east of St. Mere Eglise in support of the 502nd Parachute Infantry Regiment. The drop went poorly, and the battalion lost 11 of its 12 75mm pack howitzers. The Paratroopers of the battalion fought as infantrymen until replacement howitzers arrived on 14 June 1944.] The battalion executive officer, Major Louis H. Cotton, was wounded during the drop and had to be evacuated. During Operation Market, the 377th PFAB landed on 19 September 1944 (D+2), occupied firing positions at the landing zone, and supported 1/506th PIR's defense against a German counterattack near Zon, as well as the 502nd PIR's attack from Best toward St. Oedenrode. The battalion remained near St. Oedenrode until it was withdrawn with the division to Camp Mourmelon in France. They also were involved in the Battle of the Bulge. David Horace Bagwell died on 2 February 1967 in South Carolina at age 50. He was buried at Beaufort National Cemetery, Beaufort, Beaufort County, South Carolina. Roy Ernell Bagwell was born on 29 October 1918 in Cross Keys, Union County, South Carolina. He was the son of David Hampton Bagwell and Nannie Pearl Bailey. Joined the US Navy in 30 November 1939. He was a Chief Petty Officer (CPO) during World War II and Korea. Roy Ernell Bagwell died on 18 November 2011 in Missoula, Missoula County, Montana, at age 93. He was buried at Germonds Cemetery, New York City, Rockland County, New York. Mary Louise Bagwell was born on 29 January 1924 in Union County, South Carolina. She was the daughter of David Hampton Bagwell and Nannie Pearl Bailey. As of after 1930,her married name was Amerson. Mary Louise Bagwell married Thomas James Amerson after 1930. Mary Louise Bagwell died on 10 July 2001 in Charleston, South Carolina, at age 77 Mary L. Bagwell Amerson, 77, of Charleston, widow of Thomas James Amerson, died Tuesday morning in a Charleston hospital. Funeral services will be held Thursday, July 12, 2001, at 10 o'clock in Rantowles Baptist Church. Burial will be held at 2 o'clock, Thursday, in Beaufort National Cemetery, Beaufort, S.C.
1941 Savage Road, Suite 200-A, Charleston, S.C. 29407, or to a charity of one's choice. of the late David Horace Bagwell and Nan Bailey Bagwell. She was a graduate of Cross Anchor High School in Union, S.C. She was a retired Executive Secretary. She attended Rantowles Baptist Church. brother, Roy Ernell Bagwell of Missoula, Mont. Arrangements by JAMES A. DYAL FUNERAL HOME, 303 SOUTH MAIN ST., SUMMERVILLE, S.C.
(The Post and Courier July 11, 2001.) She was buried at Beaufort National Cemetery, Beaufort, Beaufort County, South Carolina. Thomas James Amerson was born on 1 August 1916 in Sumter, South Carolina. He married Mary Louise Bagwell, daughter of David Hampton Bagwell and Nannie Pearl Bailey, after 1930. 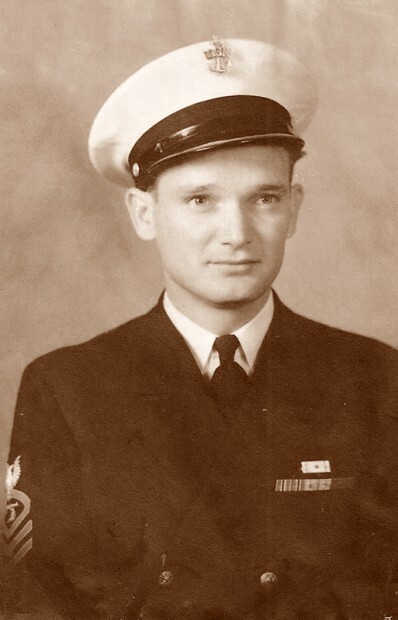 He was a M2C in the US Navy during World War II. Thomas James Amerson died on 27 September 1979 in Charleston, South Carolina, at age 63. He was buried at Beaufort National Cemetery, Beaufort, Beaufort County, South Carolina. Melvin D. Bagwell, 74, of Norfolk went to be with the Lord at his home surrounded by his family Sunday, December 16, 2012. He was born in East Lake, North Carolina September 3, 1938 the son of the late Clarence and Levonia Bagwell. Melvin was a member of Gateway Free Will Baptist Church for 41 years. He retired from the Virginian Pilot Press Room after 44 years of service. Melvin is survived by his loving family including his wife of 46 years Vivian Leigh Cornette Bagwell; three sons, Matthew Bagwell and his wife Tracy, Daniel Bagwell and Andrew Bagwell and his wife Judy; eight grandchildren and two great grandchildren. [S5392] Email from Matthew Wayne Bagwell dated May 2018 to Hunter Wayne Bagwell; Subject Line: Bagwell Family. Vivian Leigh Cornette married Melvin Douglas Bagwell, son of Clarence Melvin Bagwell and Levonia Louise Bateman, after 1963. Lucille Davis was born on 19 June 1910. As of after 1920,her married name was Bagwell. She married Marvin Henry Bagwell, son of Burrell Lafayette Bagwell and Lou Ella Hicks, after 1920. Lucille Davis died on 15 October 2000 at age 90. Marjorie Bagwell was born on 29 July 1914 in South Carolina. She was the daughter of Burrell Lafayette Bagwell and Lou Ella Hicks. As of after 1925,her married name was McCranie. Marjorie Bagwell married Melvin Haywood McCranie after 1925. Marjorie Bagwell died on 7 September 1961 at age 47. She was buried at Greenwood Memorial Gardens, Hodges, Greenwood County, South Carolina. Melvin Haywood McCranie was born circa 1912 in South Carolina. He married Marjorie Bagwell, daughter of Burrell Lafayette Bagwell and Lou Ella Hicks, after 1925. Melvin Haywood McCranie died circa 1960. Lucy Thornhill married Lewis Weber Bagwell, son of Spurgeon Hayden Bagwell and Minnie Agnes Thompson, after 1945. Edythe Camilla Kerigan was born on 10 August 1920 in Weston, Lewis County, West Virginia. As of 2 July 1959,her married name was Bagwell. She married Ernest LeRoy Bagwell, son of Arlo Bagwell and Mona May Ice, on 2 July 1959 at Monongah, Marion County, West Virginia. Edythe Camilla Kerigan died on 27 May 1997 in Marion County, West Virginia, at age 76. She was buried at Grandview Memorial Gardens, Fairmont, Marion County, West Virginia. George Hamilton Bagwell was born on 3 October 1832 in Accomack County, Virginia. He was the son of Thomas Poulson Bagwell and Sarah Hamilton Wise. George Hamilton Bagwell married Rose Dix Twyford on 7 May 1868 at Drummontown, Accomack County, Virginia. George Hamilton Bagwell died on 15 December 1892 in Northhampton County, Virginia, at age 60. Rose Dix Twyford was born on 11 October 1848 in Accomack County, Virginia. As of 7 May 1868,her married name was Bagwell. She married George Hamilton Bagwell, son of Thomas Poulson Bagwell and Sarah Hamilton Wise, on 7 May 1868 at Drummontown, Accomack County, Virginia. Rose Dix Twyford died on 9 September 1898 at age 49. Kathleen Tabitha Bagwell was born on 22 February 1866 in Onancock, Accomack County, Virginia. She was the daughter of George Hamilton Bagwell and Rose Dix Twyford. Kathleen Tabitha Bagwell died in August 1968 in Babson Park, Norfolk County, Massachusetts, at age 102. Adele Hamilton Bagwell was born on 17 January 1869 in Onancock, Accomack County, Virginia. She was the daughter of George Hamilton Bagwell and Rose Dix Twyford. As of 7 September 1892,her married name was Ward. Adele Hamilton Bagwell married William Lipscomb Ward on 7 September 1892 at Virginia. Adele Hamilton Bagwell died on 13 April 1946 at age 77. William Lipscomb Ward was born in 1866 in Isle of Wright County, Virginia. He married Adele Hamilton Bagwell, daughter of George Hamilton Bagwell and Rose Dix Twyford, on 7 September 1892 at Virginia.